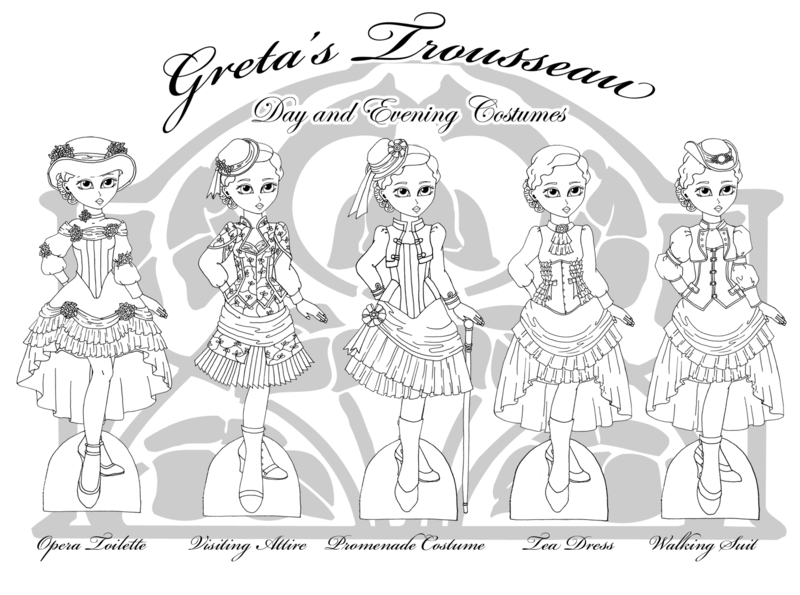 In the continuing epic of Greta’s Trousseau, today we have a bunch of outfits designed to help Greta do more mundane activities than fencing or hunting. Like any fashionable neo-victorian lady, Greta simply must have a costume for all occasions and her trousseau provides. Today’s outfit set includes an opera toilette which fitted into a rather odd spot in the ladies wardrobe. Opera attire and ballgowns were both considered to be full dress (the most formal sort), but opera outfits usually included some sort of cloak (which I have omitted because eventually I’ll do a whole set of outerwear) and some sort of hat or headdress. I’ve also noticed that they seem to be a little more fanciful than other costumes. Greta’s consists of an off the shoulder top with a boned bodice, a floral decorated top hat and a full skirt without a train. She wears matching shoes. Her promenade costume and visiting attire would have both been semi-formal wear. The promenade costume features a military influenced jacket where as the visiting attire is softer and more lady-like. Both outfits have matching hats. Her only costume without a hat is her tea dress which she could have worn while receiving guests in her own home and therefore wearing a hat would have been odd. Changing the bodice and adding a hat, turns this outfit into a walking suit, less formal than a promenade costume but with the same military influences. Hmm… I really should have drawn her a parasol. I shall have to do that in the future. All of the shoes, except the ones with the opera costume, are “borrowed” for the other sets in Greta’s Trousseau. I just find that I can only draw so many pairs of button up boots in one sitting, though I will be doing more shoes as we expand Greta’s activities. I know I need do to some winter boots for her and she’ll be needing some for the seaside as well. 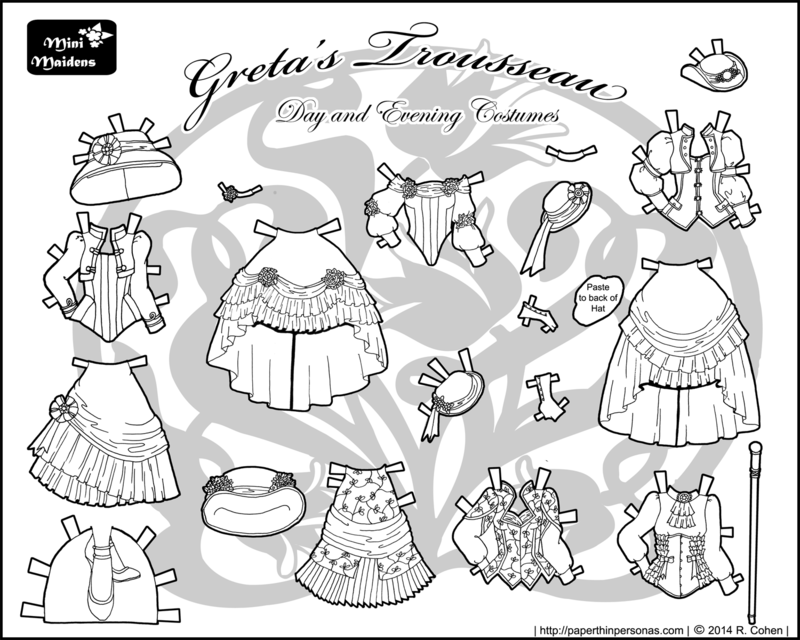 Here is the rest of Greta’s paper trousseau. I am looking forward to adding more to it as time permits. Well, there’s not really an answer for that. Sometimes I have clear ideas when I start drawing a set (Faye in the 1920s) and sometimes it’s fairly random. Greta’s Trousseau was one of those projects I started, and then drifted off of long before I actually got any of it posted. So, when it was beginning to be drawn (long before it was posted) Hazel didn’t exist and Faye had more sets then Greta, so Greta got the first set. Of course, there’s no reason it has to be Greta’s Trousseau. It could be Faye’s or Hazel’s, that’s part of the fun to being able to dress the dolls in each other’s clothing. i love this series! so many lovely bodices!